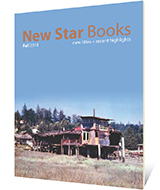 LitDistCo will accept New Star Books returns until July 31, 2016. You can usually find a living, breathing human to speak to if you call us between 10 am and 4 pm, Monday to Friday. Bear in mind that we're on the west coast of North America. 107 – 3477 Commercial Street. New Star accepts and reads unsolicited manuscripts. If you â€œgetâ€� what we do, and have a proposal that you think will fit into our list, please consider us. See our Submissions page for more information.